After about 25 days, the Sani-Con motor quit. We've had it replaced, also one of the dump valves had frozen partly open (the gray valve). All seems to be well now. But the replacement came with hose and nozzle. So now I have 3 nozzles, 1 old and 2 new, as I had previously purchased a new one about 2 weeks ago. Our use of the PC has changed somewhat in that we no longer do the 'hit and run' of a single overnight but now plant ourselves at a location and use the TOAD to explore from it for 3 or more days. Consequently, I had the factory install the valve on our PC's 3" 'emergency' drain port and found that while the Sani-Con does the job expected, using the 3" 'stinky-slinky' port provides better evacuation of the black tank's solids. I'm sure this is due to the surge of the greater volume and faster flow of the large port versus the slower Sani-Con system. ... I had the factory install the valve on our PC's 3" 'emergency' drain port and found that while the Sani-Con does the job expected, using the 3" 'stinky-slinky' port provides better evacuation of the black tank's solids. I'm sure this is due to the surge of the greater volume and faster flow of the large port versus the slower Sani-Con system. Bob, what "valve" had to be installed for you to do this? (I was assuming, since we don't pick our new PC up for another week & a half, that one can just use the emergency dump whenever one chooses.) ??? The earlier models of PC did not come with the 3" valve, just the Sani-con. My 2010 did come with a 3" opening with a cap mounted just after the pipe turns to the side to go to the Sani-con. It was to allow one to get access to the drain pipes coming from the black and gray tanks. In 2011 there was some discussions on this forum about this opening. 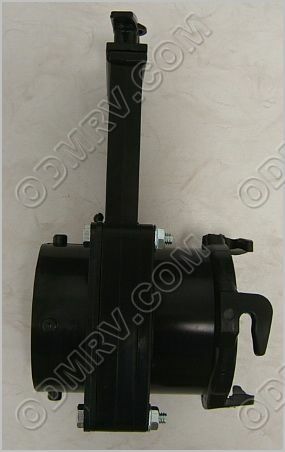 Shortly after that the pictures of the new PC showed a 3" emergence valve from the rear of the motorhome. My 2012 came with this opening with a valve to control the flow to the opening versa just the opening. Some of us like to use the Sani-con for one nighters and the 3" for longer stays. The 3" allows us to open the gray valve and leave it open. We then close it to collect some water, just before we need to dump the black tank. We open the black tank, drain and flush it, close the black tank. Then open the gray again to dump the water, thus flushing the hose with soapy water. It helps to keep the hose from stinking. Never and I repeat never leave the black tank valve open after dumping it and always put at least one bowl of water into the bank. If you don't follow this rule, you will end up with "THE CONE " that will stop up the tube coming down from the toilet. It is a major job to remove this cone by using water and a long rod to break up the cone. At a dealer the new guy normally gets this job. Some campgrounds have the sewer pipe with threads and some don't. You should be able to insert the end/cone of the hose into the sewer. You will see all kinds of ways to hold the hose in the pipes that are not threaded. Tom beat me to it with the explanation. Also, I suggest you occasionally drain the gray water tank using the Sani-Con to get that last little bit of schmutz between the 3" port and macerator out, especially when winterizing. I always use the Sani-Con, don't carry a 3" hose (probably should). When hooked up for extended stay, the Sani-Con bypass hose lets the gray water drain slowly with the gray valve open, it only drains to about 1/3 full. When getting close to time to drain black tank, I close the gray valve to fill the gray tank for flushing as described by Tom. I make sure to use lots of liquid in the black tank and have never had the dreaded "cones". A friend ended up with a horrible mess when he left his black valve open! The Sani-Con is noisy and could be an issue if you were concerned about dumping with very close neighbors, in these rare cases the 3" hose would be better but I just dump in the middle of the day when nobody is home! My 2010 model has the 3" outlet but no valve, just a cap. What advantage is the valve? Is it there in case the Sani-Con quits in the middle of a dump and removing the 3" cap to hook up a hose would result in a huge mess of "schmutz" as Bob calls it? If I start carrying a 3" hose for emergency, I will probably add a valve. There is a distinct advantage to having the valve because without it, removing the cap from the 3" port would allow uncontrolled schmutz flow from the "T" section between the macerator and electric gate valves. Unlike the immortal Carroll Shelby's (1923-2012) statement "If some is good, more is better. And too much is just enough", in this case, just a little is far too much. Yes, I agree with the use of both the Sani-Con for "hit-and-run" stops, and the 3" drain hose for longer stays, or when we want to flush out the tanks. Since we're still trying to figure all this out, we're experimenting with various methods of dumping, including not dumping at all for a single night if there is no immediate need. And more than just experimenting, we're practicing. (Gotta remember to make sure the gray valve is closed before dumping the black!!! I learned this the hard way. It is a long way from the end of the 3" dump line to the black dump valve!!! I found a "twist on dump valve" that just, yes, twists on to the end where the cap sits, then attach the cap to that twist-on valve. So far works like a charm, it is attached very snugly, so far it seems like it won't accidentally detach. The cap, however, is another matter: it was loose, so I wrapped layers of black electrical tape on the prongs, and it is now firmly attached as well. As for some other means of connecting the Sani-Con nozzle to the campground's sewer connection: laying the nozzle without screwing it in would require some form of weight to hold it in place, such as a concrete block, which we don't want to carry, or a large, heavy rock, which is not available at the park where we're currently staying. FWIW: I did contact Thetford regarding this, and they have no solution. I'm currently contacting stinky-slinky sources to see if there is some way to adapt their connectors to the Sani-Con hose. If I learn anything useful, I'll add it here. Thanks for all the feedback, I'll be asking more questions, as there is a bunch of stuff we still don't know. Hopefully there won't be any major damage to the surrounding community in our quest to figure it out. Good luck in the learning experience and be prepared for the usual mistakes. We've all made them. How about taking a coat hanger, cutting out about 12", bending it into a U. Turn the U over the hose near the end and push it into the ground to hold the hose in place. simple, light weight and easy to store. Your wife's foot works pretty well too. 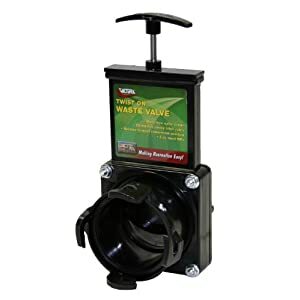 I found a "twist on dump valve" that just, yes, twists on to the end where the cap sits, then attach the cap to that twist-on valve. So far works like a charm, it is attached very snugly, so far it seems like it won't accidentally detach. George, I never heard of it until your comment. Though I don't need one myself, that is worthy for your first "Helpful". Thanks for sharing that one. For the record, this is what George was describing. It installs in seconds and is very affordable for around $20 for those who need one last barrier of protection when twisting off the end cap. I like your very inexpensive, quick solution idea. A "helpful" for Tom.